After an unexpectedly packed first night in Lovina, we had a good rest till the sun was way up before making our way to our first stop, Singaraja. It is fairly easy to hail a bemo (a tiny van) from the main road in Lovina, Jalan Raya Lovina-Singaraja. The bemo heading east should get you to Singaraja in about 20 mins for 10,000 IDR. 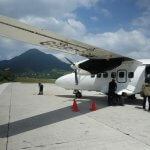 We told our driver that we were going to Gedong Kirtya and were dropped somewhere near to it. Google Maps got us through the remaining 5-10 mins on foot. The rest of our Singaraja explorations were done on foot. (Though we came back 2 days later by car to visit some of the attractions that were closed on our first visit). Monument at junction of Jalan Veteran and Jalan Gajah Mada. We actually visited the museum 2 days later as the day we arrived was a Sunday and the museum was closed. Good lesson in doing some homework before setting off. 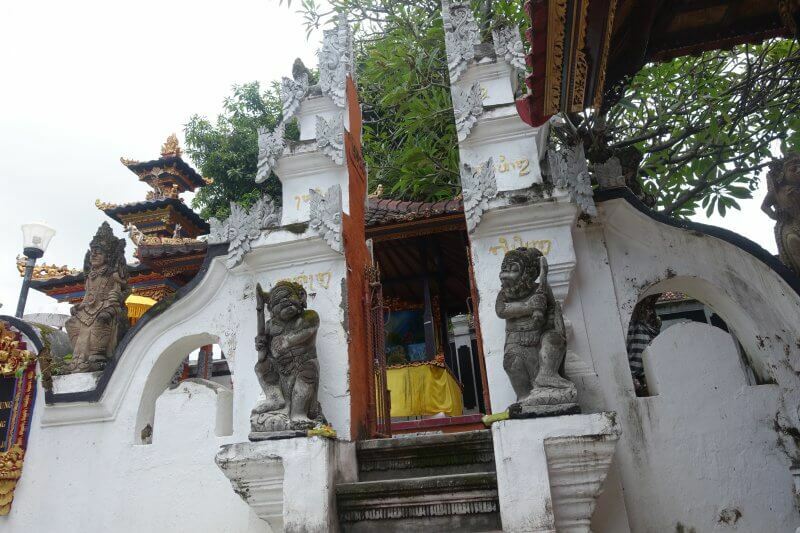 Gedong Kirtya is a small museum which houses some of the most important ancient manuscripts in Bali. 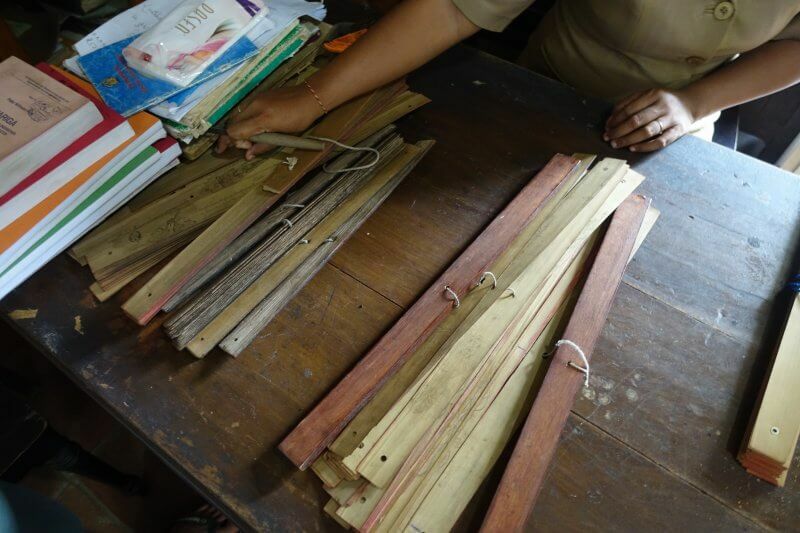 These manuscripts, or lontar, are inscriptions on the dried palm leaves. 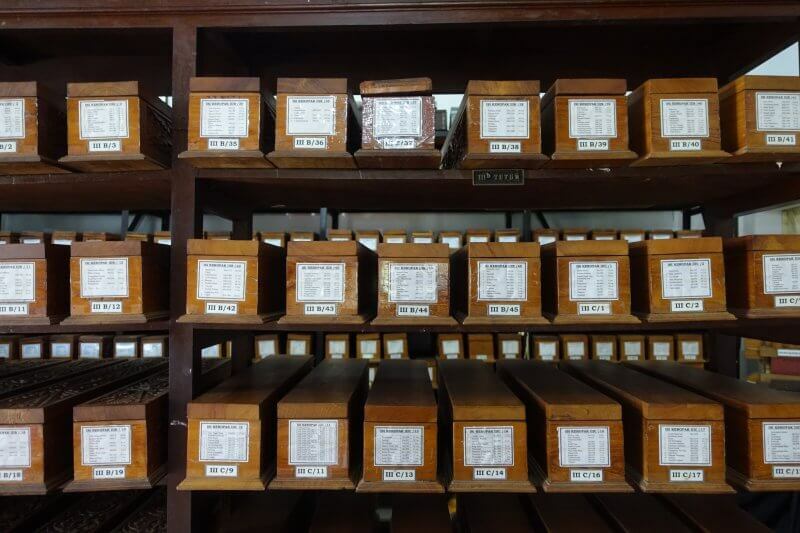 Staff at the museum are involved in the preserving, cataloging and replicating of these precious bits of history. One of them guided us around and showed how the manuscripts were stored, what stories they hold, and how they are created. 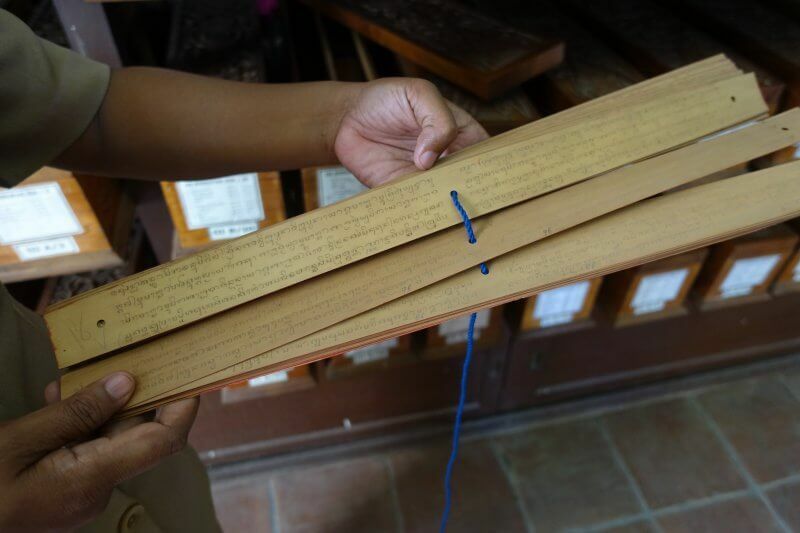 Carefully kept and catalogued lontar manuscripts. 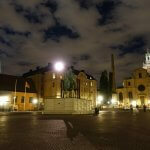 Also in the museum are inscriptions on bronze plates dating back almost a thousand years (10th century). 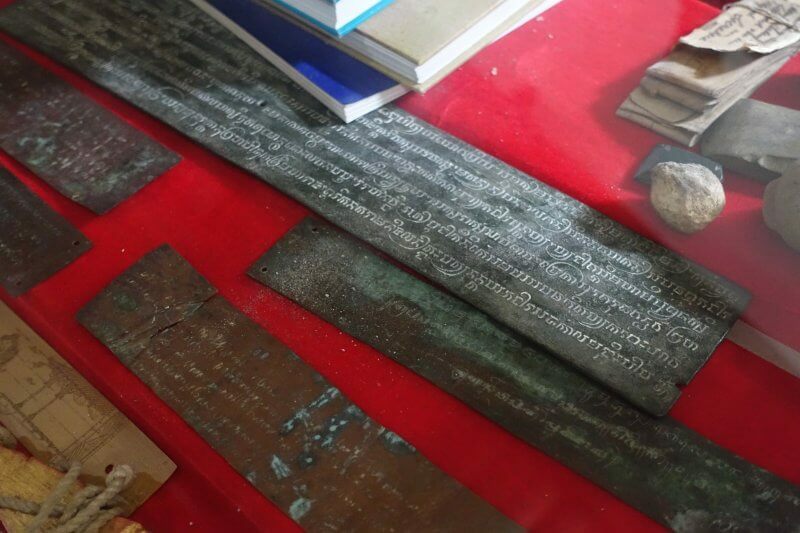 Inscriptions on bronze/copper plates from the 10th century. Demonstration of the inscription process on lontar. 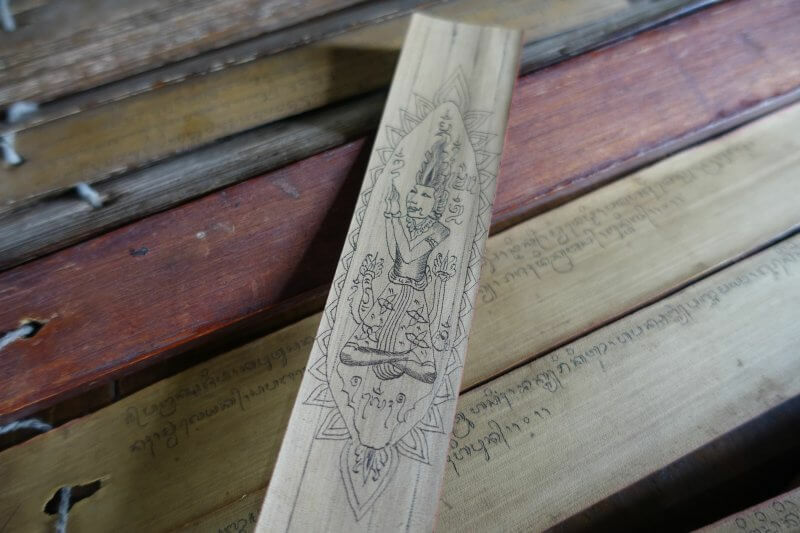 There were single lontar pieces carved by the staff for sale which I assume would go towards preservation of this art form as well as the operation of the library/ museum. Souvenir which is supposed to help you keep bad luck at bay. 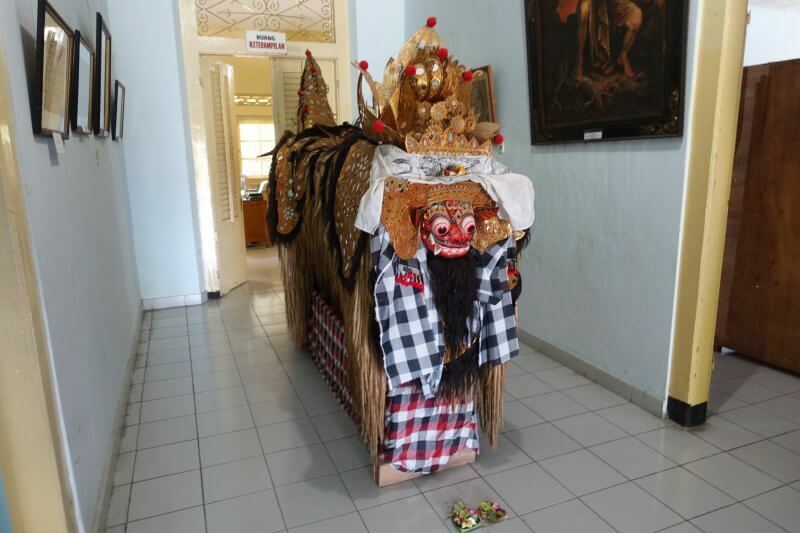 Likewise, we turned up at Museum Buleleng on a Sunday to find it closed, and returned 2 days later. 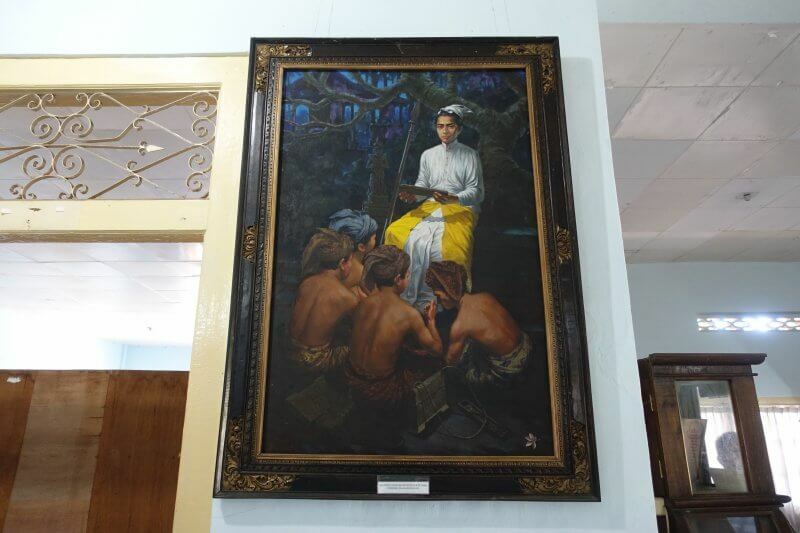 Museum Buleleng is also a small museum that can be completed in less than 30 minutes. 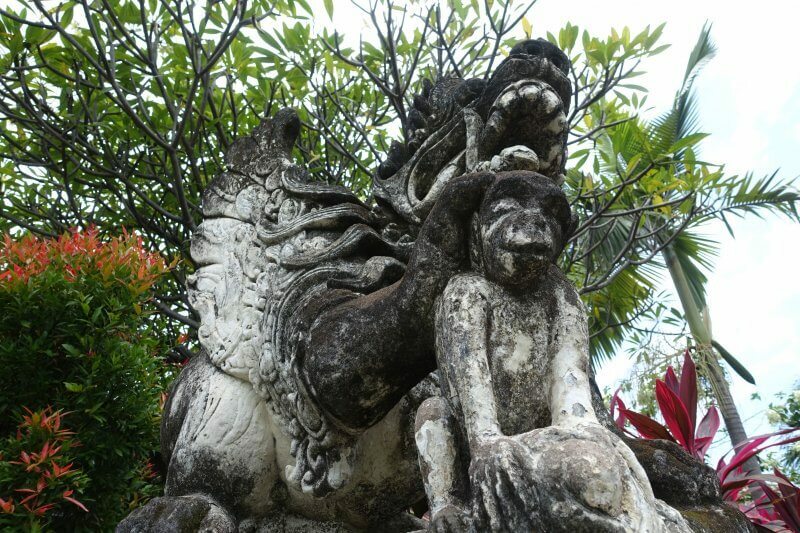 Buleleng refers to the regency which covers most of the north coast of Bali. Buleleng has its roots as a 17th century kingdom, and artefacts at the museum are dedicated to the culture and heritage of Buleleng. Information and displays are quite basic but there are still stories to be gleaned from the museum. 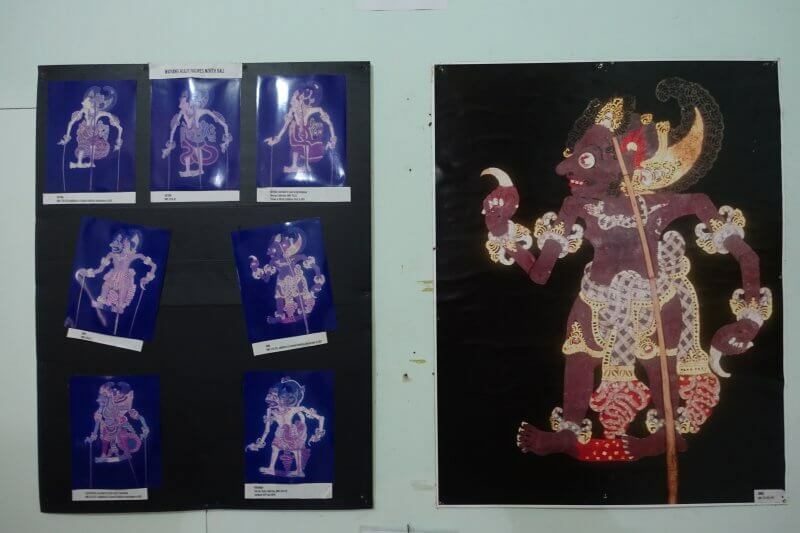 Wayang Kulit, shadow play puppets. Paintings of royalty, probably from Dutch times. 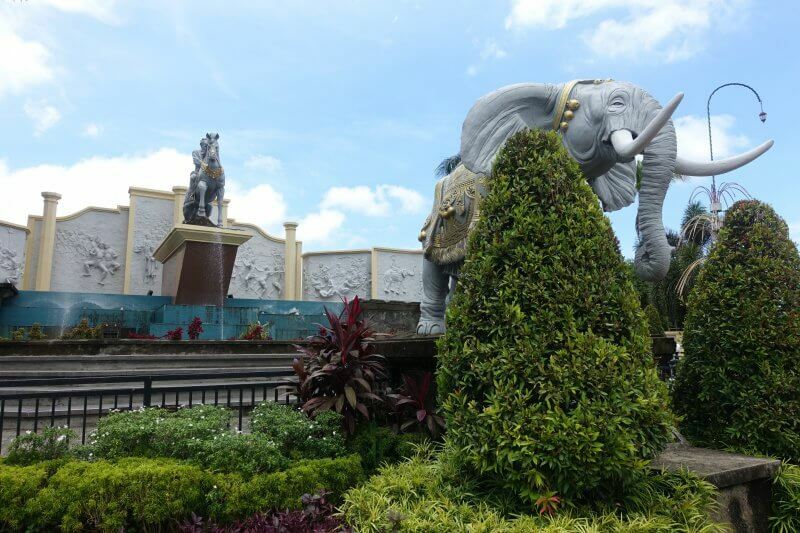 Puri Agung Singaraja is the royal palace of Singaraja, and is open to public for free. It was a little awkward when we visited as there was some ceremony going on. We were apprehensive to interrupt, but locals outside gestured for us to enter and so we did. 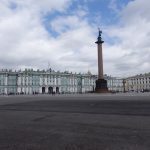 Without a guide or information it was hard to make out what was there in the 17th century palace. We had fun exploring the architecture, courtyards and sculptures though. 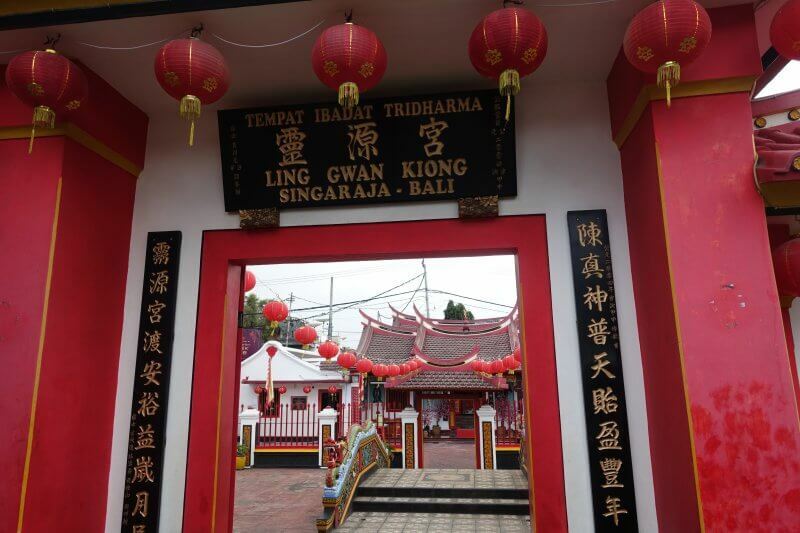 One of the courtyards in Puri Agung Singaraja. On to food! 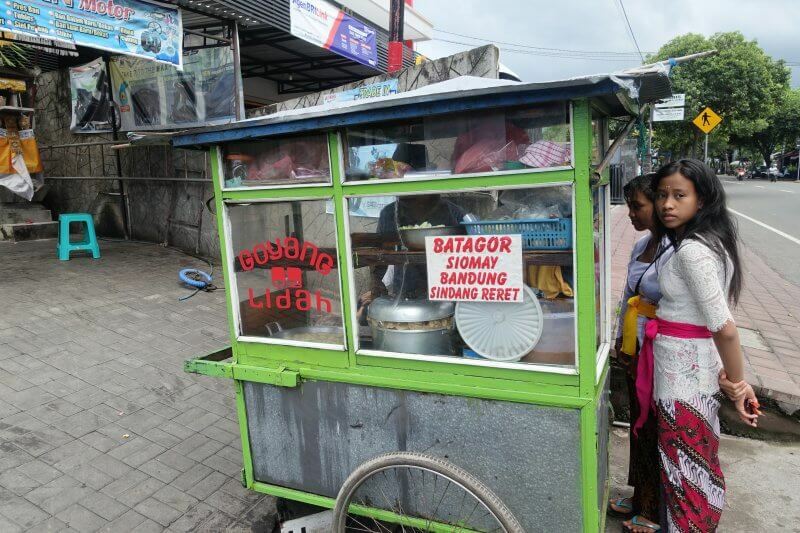 Throughout Singaraja you’d see many roadside stalls selling siobak and batagor, 2 delicious dishes you should try while at Singaraja. 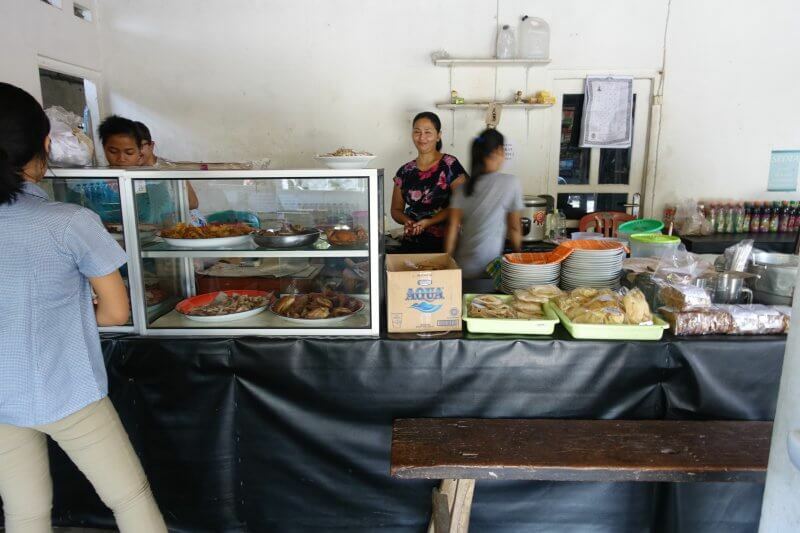 This was on our second visit to Singaraja too, but you can find this stall along Jalan Veteran, or just try Siobak at any of the stalls you see around Singaraja. We didn’t see siobak in Lovina but there is apparently a popular restaurant in Denpasar called Warung Siobak Khe Lok. 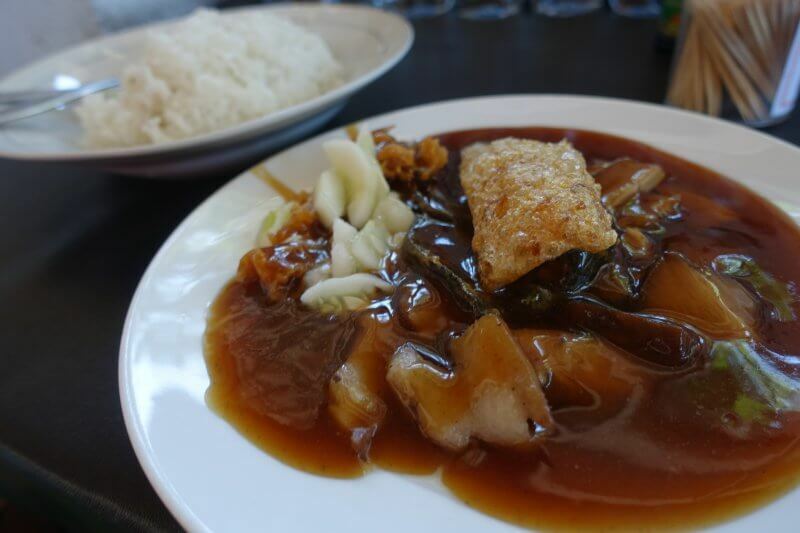 Siobak is made of braised pork, innards, boiled and deep fried pig skin, and other unknown stuff, in a thick savoury gravy, served with rice. Don’t miss it while in Singaraja! Nyoman, our driver (got him for our second visit), brought us to this stall as he felt it was cleaner than the roadside ones. You can get siobak at this stall for 20,000 IDR. We tried batagor on our first visit. How did we decide on this? We saw a queue forming and did what any sensible Singaporean would do – join the queue. Batagor is not quite a Singaraja dish but is common here. 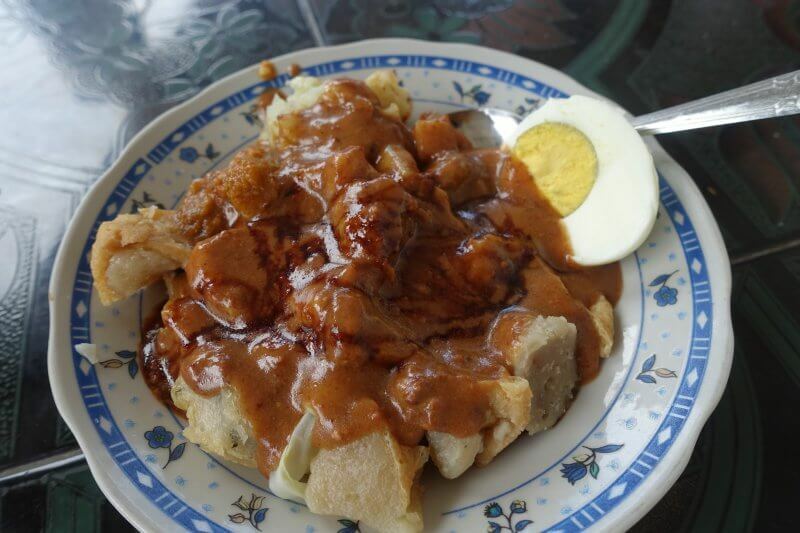 It is basically a plate of deep fried fish dumplings, covered in a peanuty gravy. Don’t be deceived by the excess of fried flour, the texture and taste of this dish is interesting and quite good. Just 6,000 IDR for this. Pura Agung Jagatnatha is a huge Hindu temple in Singaraja. While non-devotees are not allowed into the sacred compounds, from the outside the temple almost exudes a mysterious, magical feel. In front of the temple an old lady was giving blessings to devotees who stopped by, adding to the aura. 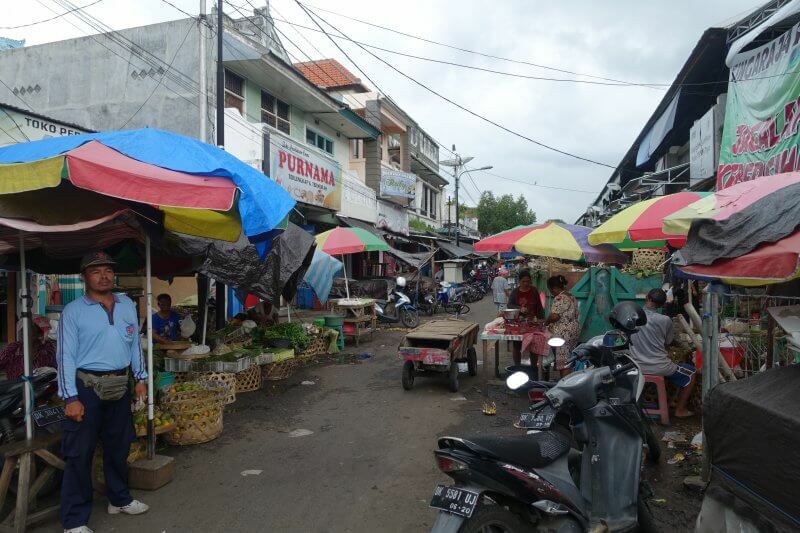 Further down the same street towards the sea from Pura Agung Jagatnatha, Jalan Ngurah Rai, is Pasar Anyar Singaraja, the local market. I love local markets and couldn’t miss this. 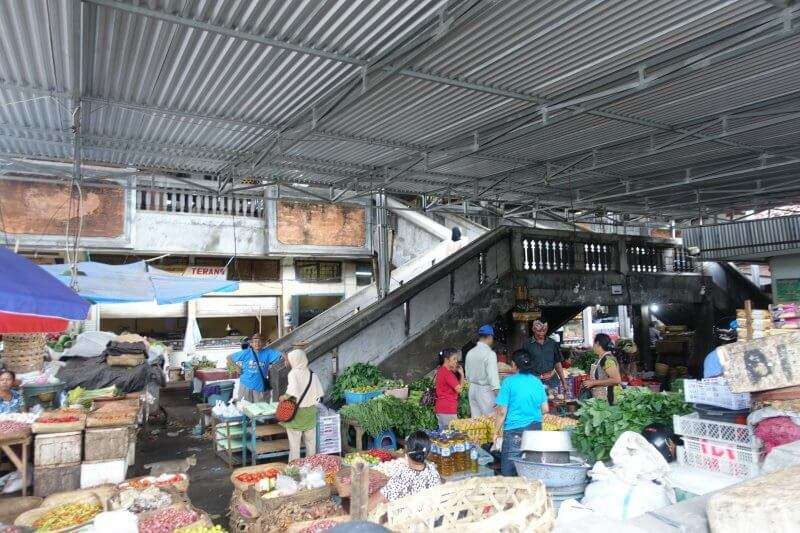 Fruits and vegetables at Pasar Anyar Singaraja. 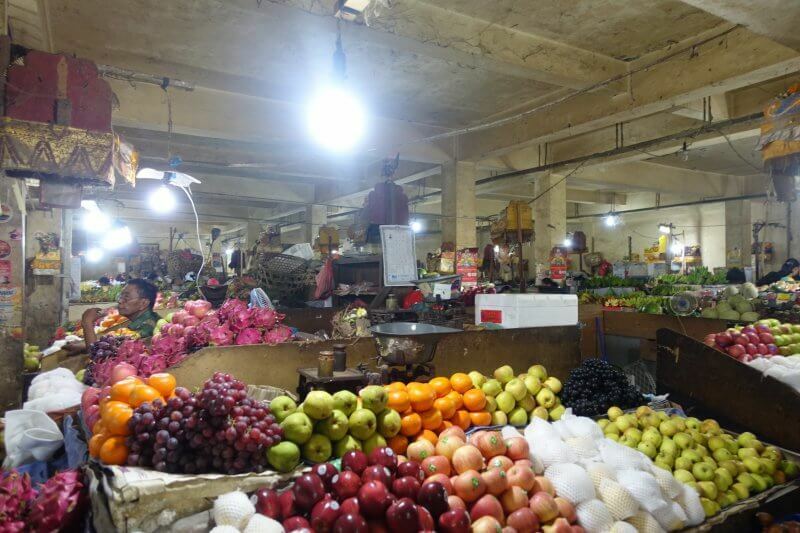 We ventured further in and found a fascinating maze of stalls along dimly lit alleys. Here’s one from a brighter spot. Another 500m further up north from Pasar Anyar Singaraja is the Bali Sea. 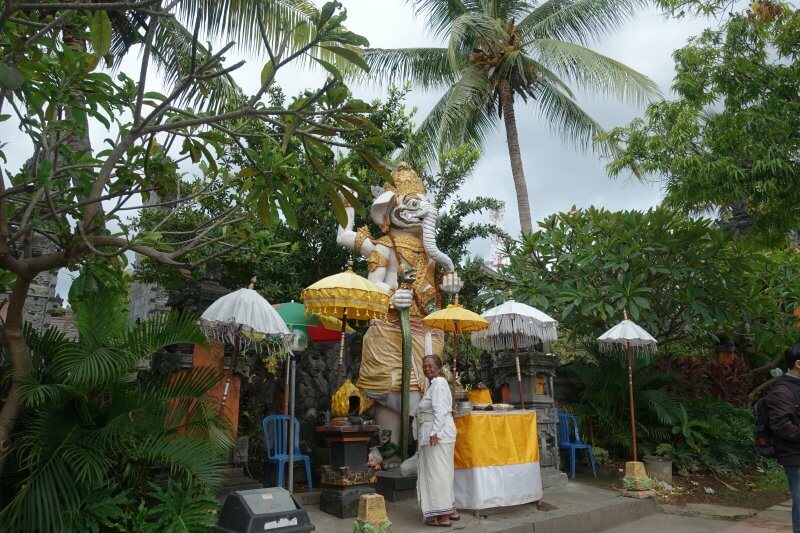 Along the coast you’d find the Yudha Mandala Tama Independence Monument. 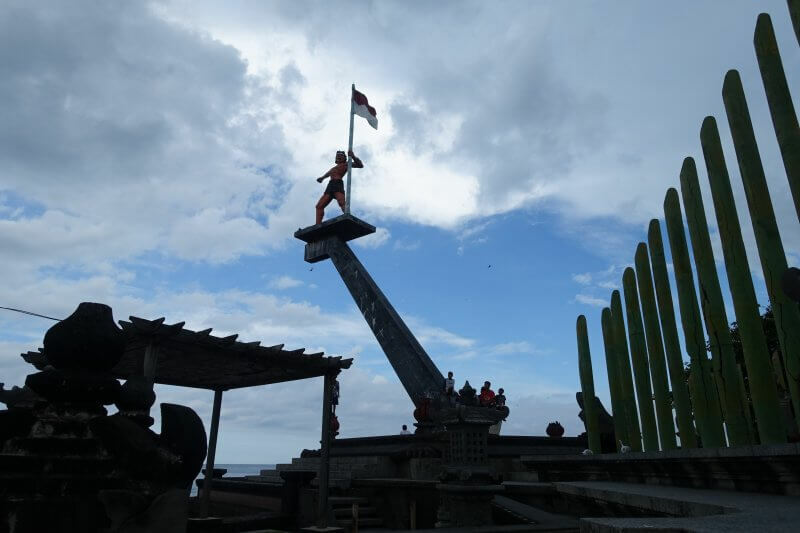 This prominent landmark in Singaraja was built to remember Ketut Merta, a local freedom fighter killed by the Dutch in Indonesia’s struggle for independence. Kids hanging out at the Yudha Mandala Tama Independence Monument. 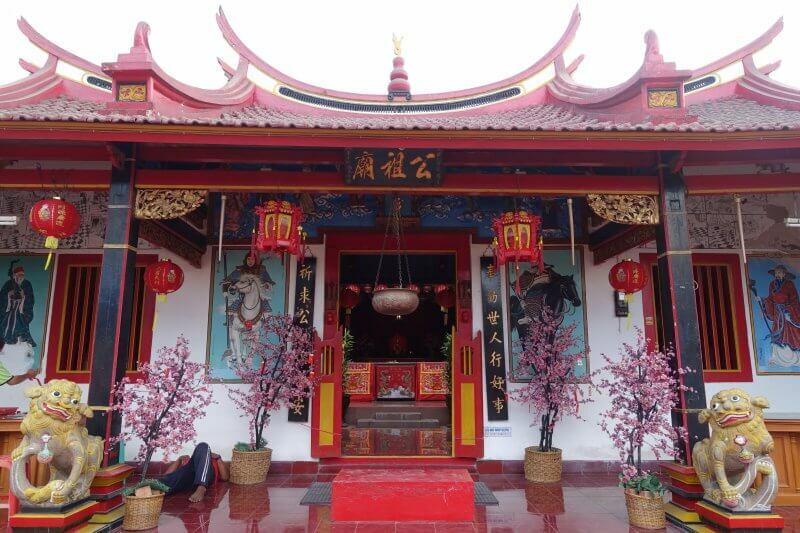 Our final stop in Singaraja was Ling Gwan Kiong Temple, a beautifully decorated and well maintained Chinese temple that started in 1873. It is also along the coast (a few minutes walk to the east from Yudha Mandala Tama Independence Monument). There are no crowds or entrance fees here, just tranquility. 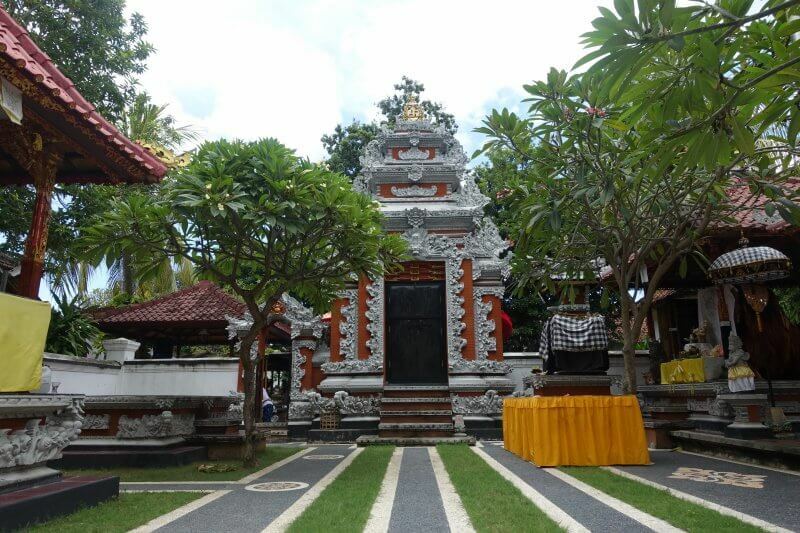 The temple is another sign of Singaraja’s multicultural heritage. With the sights of Singaraja explored, we headed back to the main street parallel to the coast that leads back to Lovina, Jalan Ahmad Yani. We attempted with little success to identify a bemo, and got distracted by JFC (Jaya Fried Chicken), the local KFC. Not quite KFC but fried chicken was nice after all that walking. The wait for the chicken took awhile and when we were finally done we again attempted to get a bemo. The first tried to rip us off with some exorbitant price, so we waited a little longer and finally got one who got us back to Lovina for 10,000 IDR. 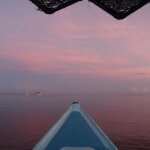 For more on things to do in Lovina, check this out. 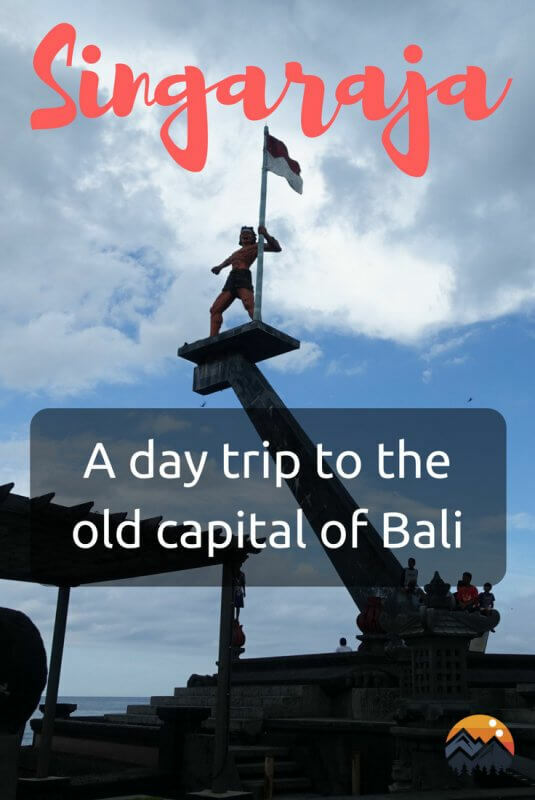 For the next parts of my trip to north Bali, exploring Jatiluwih, Bedugul, Banjar and Bantiran, stay tuned!